That Good Jobs New York accurately predicted that the parking garages at the new Yankee Stadium would be a financial debacle is of little consolation to the residents of the surrounding Bronx neighborhood, who forfeited heavily used park land so that those structures could be built with over $100 million in subsidies. Recently, New York Daily News columnist Juan Gonzalez reported that the garage developer is on the verge of defaulting on $237 million in tax-exempt bonds issued by the city’s Industrial Development Agency (IDA). This comes several months after Gonzalez revealed that the developers were being permitted to defer approximately $9 million in rent payments to the city. In March 2006, Good Jobs New York joined a coalition of environmental and planning organizations in calling on legislators to eliminate the new parking garages and redirect the public funds toward construction of the new Metro-North station. The groups criticized the city for encouraging fans to drive to the transit-accessible stadium despite the potential impacts of additional traffic congestion and pollution on the surrounding South Bronx neighborhood, which already suffers from one of the highest asthma rates in the country. In testimony before the IDA in April 2007, Good Jobs New York also argued that the garages were a risky investment due to their high costs and the likelihood that demand for stadium parking would diminish. Aside from the fact that the new stadium would seat 4,000 fewer fans than the “House that Ruth Built,” we contended that the new Metro-North station adjacent to the stadium would cause more fans to arrive by train rather than car. As it turns out, about 5,000 fans per game are riding Metro-North, and many who do drive are spurning the $23 garage parking fee in favor of on-street parking or cheaper options nearby. When you tack on the 600 free parking spaces the Yankees insisted on receiving, this all adds up to major revenue problems for the garages. In our report Insider Baseball, GJNY also exposed the garage developer, Bronx Parking, as the subsidiary of a politically connected firm with a spotty track record when it comes to publicly financed projects. The fact that it had already defaulted on two previous bonds for projects in Syracuse and Monroe County should have raised red flags among IDA board members. 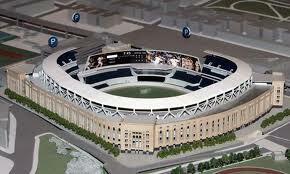 At every step of the way city officials capitulated to the demands of the Yankee organization. In doing so they set the stage for the biggest default of an IDA bond in recent memory, potentially making it more expensive to finance worthwhile projects in the future. The garages will forever stand as a monument to the Bloomberg administration’s failure to stand up to one of the biggest bullies in town, my beloved Yankees. Dan Steinberg, a PhD candidate in urban planning at Columbia University, formerly worked as a research analyst at Good Jobs New York. When a company wants to expand, it should rely on its own resources or borrowing capacity. But the truth is many companies look to federal, state, and local governments for lucrative subsidies: tax credits, low-interest loans, tax exemptions, property tax abatements, and research aid. Some estimate that state and local economic development subsidies alone total more than $50 billion each year in the U.S. This week, Boeing was found by the World Trade Organization to have received $23.7 billion in federal, state, and local government support, much of it illegally. The WTO declares a subsidy as illegal when it benefits a specific company or industry to the detriment of a rival company. Ironically, Boeing claimed to be harmed by subsidies Airbus received in Europe. Boeing played the subsidy game and won big in Washington State, Kansas, South Carolina, and Illinois. In Washington State, the Governor rammed through the legislature a special package for Boeing worth $3.2 billion. In Kansas, Boeing benefitted from enormous incentives before selling the production facility. In South Carolina, the company received an estimated $900 million package. Out-going Mayor Daley of Chicago awarded Boeing $56 million for its headquarters. Aside from state and local subsidies, the company received lavish NASA and Pentagon research contracts. As this news broke yesterday, members of Congress differed in their opinion depending on whether Boeing or its rival Airbus (or its parent EADS) was located in their home district. The WTO’s sweeping statement about the illegality of subsidizing international trade raises a great deal of questions about inter- and intrastate trade. Wal-Mart has received over $1.2 billion in state and local subsidies, often to the detriment of other local retailers. Cabela’s and Bass-Pro Shops both utilize this strategy. Gander Mountain cried foul. Semiconductor companies like Intel and AMD continue to try to gain a competitive edge over each other with our tax dollars. Would the WTO ever declare subsidies used to attract big retailers with political allies, which in turn put smaller companies out of business, as illegal even if it didn’t cross international boundaries? What about if a subsidy benefits a specific-company to the detriment of another city or state vis-à-vis interstate or intraregional relocations? The problem isn’t just that these companies get an unfair advantage. It’s hugely burdensome on our economy to spend billions each year on companies which successfully lobby for kickbacks. State tax revenues are in a tailspin as housing values decline. Every state is feeling the heat and making tough decisions. With the budget in dire straits, Texas’ Governor Rick Perry has proposed an across the board 10 percent reduction, which surely will result in painful consequences. But one cutback we’re not teary-eyed over is Gov. Perry’s announcement to thin some big economic development programs. Yesterday, Gov. 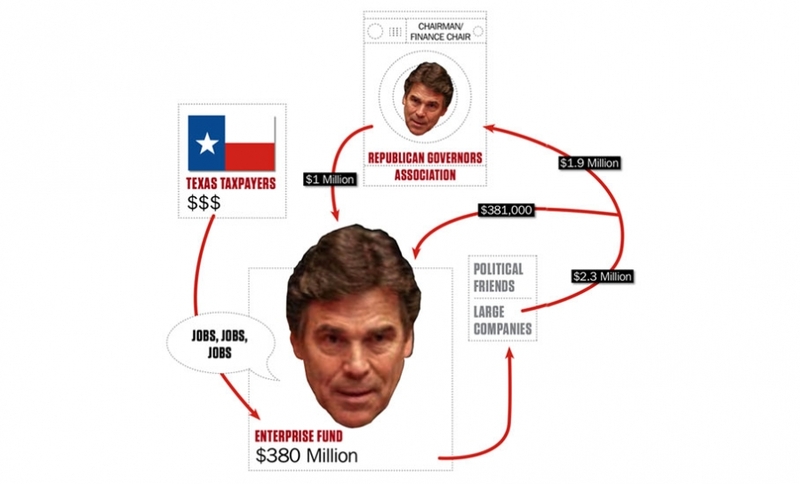 Perry proposed shaving off $38.7 million (out of the $256.5 million available) from the Texas Enterprise Fund (TEF) and the Emerging Technology Fund. Texas also trimmed back on controversial film subsidies. Recent reports have accused the Governor of using TEF for political patronage and failing to protect the taxpayer’s buck. Whatever the reason, even a terrible fiscal climate, we laud reining in on programs that aren’t effective and are apt to be abused. As this recession wears on, we wonder whether states will choose to take a closer look at the $30 to $60 billion spent each year on economic development, often to the benefit of a few companies which have the boldness to ask for our tax dollars.